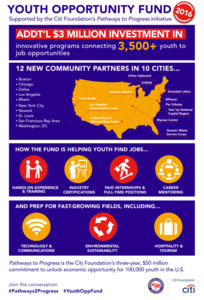 WASHINGTON, D.C., Aug. 04 /CSRwire/ - The Citi Foundation and America’s Promise Alliance announced today the selection of 12 nonprofit organizations as 2016 Youth Opportunity Fund grant recipients. The Fund – now in its second year – awarded an additional $3 million in support of programs that connect youth to opportunities that increase their employability and prepare them to compete and thrive in a 21st century economy. To date, the Fund has provided $6 million to support 24 organizations, reaching more than 7,000 youth.